The Kalos is built adequately inside and out, but it isn’t a high class car that has been built with top not products. It is an inexpensive ride that provides transportation for its passengers, but not much more than that. The Chevy Kalos is an entry-level General Motors (GM) car, meaning that it is one of the less expensive cars offered by the company. The car’s price shouldn’t dissuade buyers tough. The Kalos offers terrific value for the money. The car is reliable, stylish, and affordable to purchase and run. The cabin is made of mostly plastic features that make the cabin look like it was built on a budget. The exterior design is decent and has good lines. The Kia’s bumper moldings make the three door car more attractive. Buyers have their choice between two petrol engines. Both engines are economical and similar in quality build. The petrol engines are efficient enough that a diesel alternative is not needed. The Kalos has a tall roof and plenty of space in the cabin for front and rear passengers. The adequate cabin space especially in the rear makes it more attractive than many of the competitors. This larger supermini comes with an attractive price tag for those who want a stylish practical car but are also on a budget. The car’s engines are very economical, yet have a simple enough design that if you have engine problems it won’t cost a fortune to fix. Insurance and maintenance costs are low too, so combined with Chevrolet’s warranty and servicing package and the Kalos offers great value for cost. Compared to other superminis the Kalos has great cabin and boot space. If additional cargo space is needed the rear seats fold down creating extra room. Controls and dials are very simple and easy to use. There is nothing fancy or complicated about the control system in the Kalos, it is all very basic. Most of the cabin’s features are plastic, nothing real elaborate but it is all functional. The Kalos will not be comfortable to everyone. Seating and steering wheel adjustments are limited and may not adjust comfortably to suit all body types. The fabric upholstery covering the seats has a less than quality feel, and the seats lack side bolstering. The car has adequate accessibility. Rear riding passengers must fold down the front seats in order to gain access to the back, but the front seats are lightweight and are easily moved. The roof of the car is tall and rear passengers shouldn’t have to bend too low to access the cabin. The Kalos is a very simple car to park, it provides all around great visibility, and light easy steering. Parking sensors are not included but they aren’t really necessary in the Kalos either. The Kalos is not a powerful car. It is economical and practical for someone who does a lot of city driving or who wants an economical commuter car. Steering feedback is lacking, but the standard ABS braking system works well. The Kalos is plenty large enough to transport a family from point A to point B. It is not a powerful car though and the small engines may struggle with any terrain that is even the slightest bit challenging. The Kalos was designed for city travel and not rough or adventurous terrain. The Kalos would make a great first car. It’s affordable and a good size for novice drivers. The Kalos would be affordable to run and insure, and it doesn’t have the kind of power that might get a new or inexperienced driver into trouble. 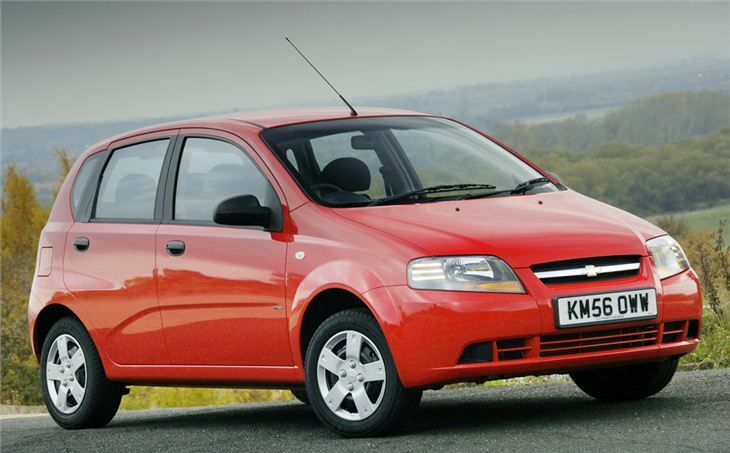 The Kalos was first owned by Daewoo and is now owned by Chevy. The car is basically the same, but Chevrolet believes that the addition of the Chevy symbol has increased the cars image, especially with teenagers and younger drivers. It is unclear how the UK will view the Kalos. Chevrolet has outfitted the Kalos with keyless entry and an immobilizer system. This car is probably not high on a thief’s hit list for auto theft. Of course, an alarm could be added for good measure. The car is outfitted with driver and front passenger airbags, all of the seats come equipped with three-point seat belts for additional safety. Isofix child seat mounts are located in the rear on the right and left passenger sides. The Kalos comes equipped with a standard stereo unit that includes a CD player and speakers. Sound quality is good and is capable of producing enough sound to drown out the engine noise. The Kalos looks more attractive in bold colors such as red or white. Some colors may not just be ugly on the Kalos, but they may actually reduce the car’s resale value. The cars interior is completely grey. In the United States the Kalos is called the Aveo and is the best selling entry level car. The Kalos is a large sized car within its sector, it’s fairly comfortable, inexpensive and reliable. Kalos doesn’t beat out all the competitors, but it does merit serious consideration.